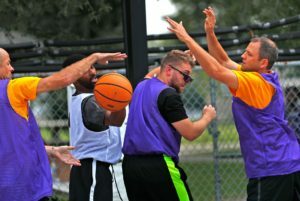 Roger Hasper, with Goodwill, from left, Taylor Hopkins, with Goodwill Guides, Austin Paschal, with Marion County Probations, and Eric Schlegel, Vice President for Goodwill Southern and Central Indiana Retail Division, battle during a basketball game at Goodwill Commercial Services, Wednesday, Sept. 19, 2018. 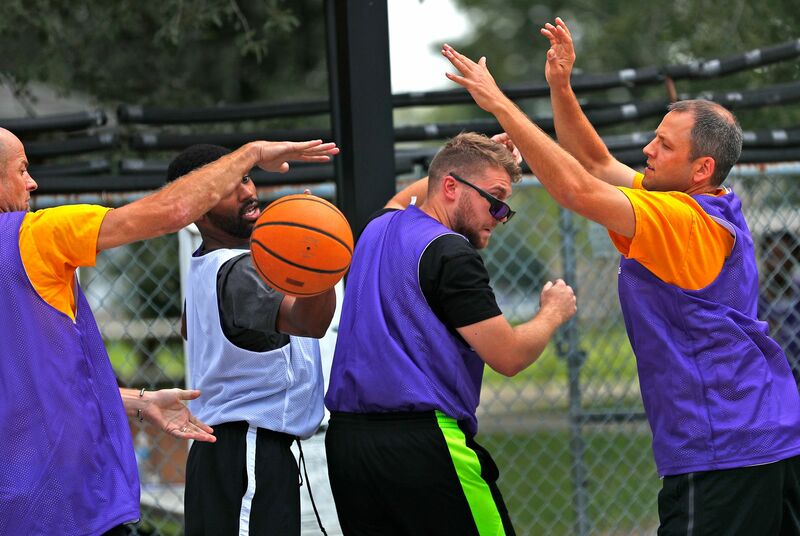 The goal is to celebrate the New Beginnings program while breaking down re-entry barriers through basketball. Goodwill Industries of Central Indiana’s New Beginnings hosted the 3-on-3 basketball tournament bringing together participants in New Beginnings, a six month re-entry program for ex-offenders that work on job and life skills, with representatives from Goodwill, IMPD, the Mayor’s Office, Marion County Probation department and other services.